I have a love hate relationship with ice cream. I think the general idea is great but my husband isn’t a fan of the cold sweets. That means the kid and I usually end up eating all of the calorie loaded dessert on our own. With this flavor… I’m ok with that. 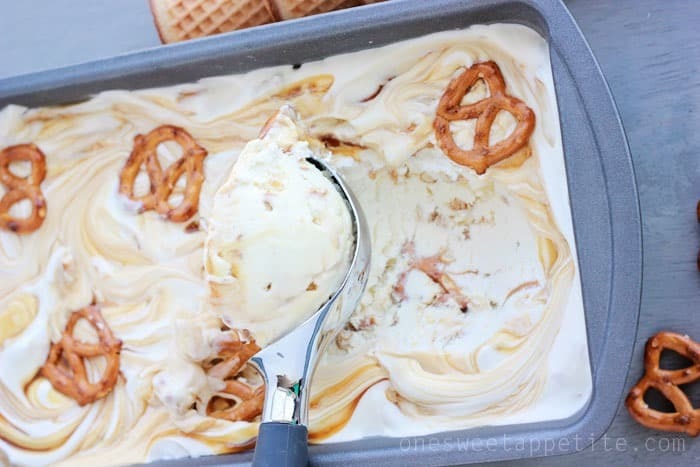 In fact, I’m ok not sharing this Caramel Swirl Pretzel Ice Cream with anyone. Ever. It’s too good. I’m maybe even guilty of licking up the drips off of my counter. Maybe. Whip your heavy cream with an electric mixer until light and fluffy. Set aside. In a large bowl stir the sweetened condensed milk with the pretzels, vanilla, and salt. Fold in the whipped cream. Pour half of the batter into a freezer safe container. 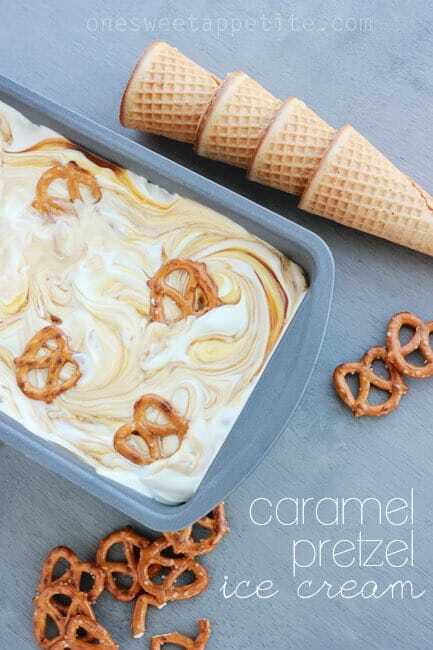 Drizzle a generous amount of caramel sauce over your mixture and swirl in with a knife. Pour the remaining batter over the top and repeat with remaining caramel. *Get my recipe for salted caramel sauce here. The creamy texture is always a little surprising. It almost seems like something so simple shouldn’t taste this great. You have to try this. And try it with different flavors! Add some mint with chocolate chips and you’ve got one rockin’ flavor. OR try graham crackers and lime juice for a key lime! 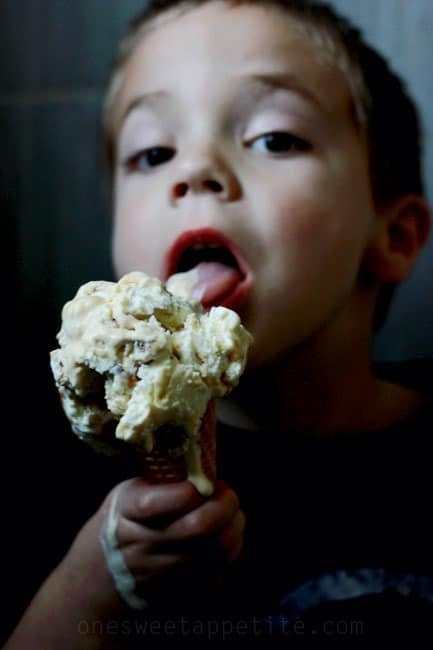 One of my favorites is a simple fudge swirl and the kid loves a good ol’ cake batter ice cream. The other down side? It’s messy. My five year old manages to get drips everywhere. Clothes, hands, face, tables, chairs… Whenever he has a scoop we try to keep him confined to a small space. Luckily I picked up some Wet-Nap wipes from Walmart (love those every day low prices) to keep on hand for occasions just like this! The pop up wipes have a permanent spot next to my kitchen sink and I love the individual wrapped hand wipes for my purse! 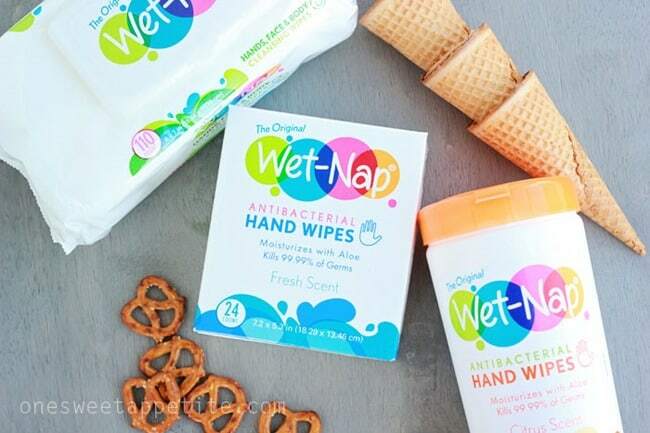 Right now you can snag a coupon for fifty five cents ($.55) off of any Wet-Nap product which means you save AND get to start your Wet-Nap addiction (you can thank me later). The bottom line is that you need to make this recipe and keep Wet-Nap’s on hand to help clean up those messy spills. If you are a fan of the salty sweet combo you’ll fall in love with every spoon full. I love the hidden bits of crunch that are added with the pretzels! 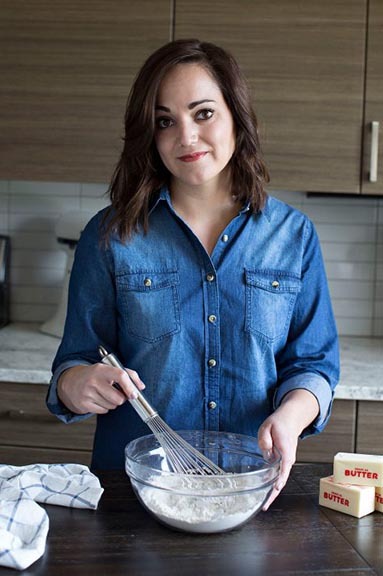 Hi Jessica, I don’t think I have visited you yet but your blog is beautiful and this recipe looks amazing. Saving it for later. I found you the Facebook Daily boost group. Have a great week! Omg! That looks so yummy!!! Deff love pretzels and the sweet and salty flavor combo. I love mixing them. Great recipe! This looks so incredible. My boys would love the fact that they can make it themselves. Oh my goodness!! That is some ridiculous goodness right there! And how does one not like ice cream!? I can’t even wrap my head around that! And, yes, wet wipes are definitely a necessity when my kids eat ice cream (and sometimes me too!). I love that it doesn’t need a machine! We got rid of ours last year when we needed to downsize our appliances and I have been sad ever since. I think my taste buds just went into virtual heaven. Can’t wait to try this! A sweet with a little salty is my kind of treat! Yum! 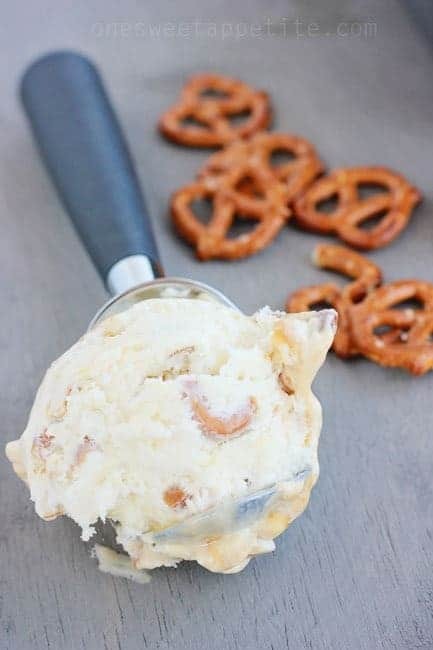 I love sweet and salty so this sounds like the perfect ice cream for me. I can’t wait to make it! AND, wow! That recipe looks FAB…pinning for sure! Oh my goodness this looks amazing!!!! And thanks for the coupon! 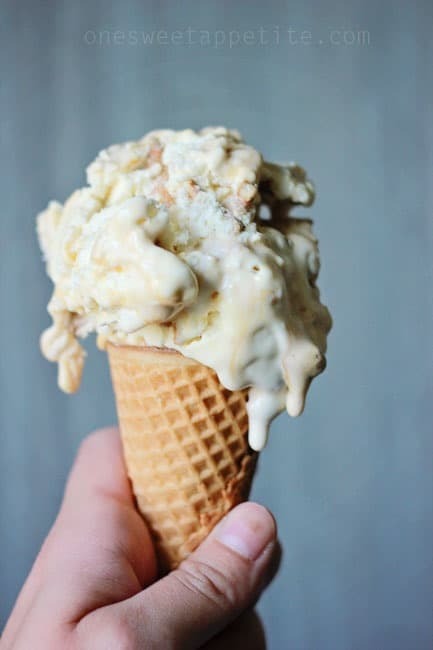 Your ice cream recipe looks divine! I need to get some Wet Naps for my classroom. Thanks for sharing the coupon. That looks so good, I could steal the cone from the kid 😉 Wet Naps are a necessity! I love caramel and pretzels. What a perfect combination. Oh my wordy this looks absolutely DIVINE! Like seriously. I need it now. Right now. Gah!! Thanks a lot 🙂 Ha! No but seriously – thanks for the great recipe! Oh my goodness! This looks and sounds amazing – can’t wait to try it! That looks amazingly good and so worth the calories! Oh my gosh, that looks and sounds AMAZING! Ohmygoodness I can’t wait to try this!! Thanks!